Each of these five 12'x24' wall assemblies was evaluated in its entirety for the decision metrics the authors outlined, rather than by select components. Rarely is anything in the built environment made of a single product. “So why do we approach materials research and selection at the product level?” a new study conducted by Re:Vision Architecture asks. Based on a decision matrix where each of these metrics was equally weighted, a truss I-joist (TJI) assembly and a double-stud wood assembly with fiberglass insulation scored highest. Both scored high in thermal performance and had low embodied carbon. A single-stud wood assembly closely followed, only a few points behind in the toxicity category. A concrete masonry unit (CMU) and a metal stud assembly were the lowest performers, scoring “poor” in thermal performance and embodied carbon footprint, respectively. Notably, the study found that the metal stud assembly with spray foam had an embodied carbon footprint more than six times that of the double-stud wood assembly with fiberglass insulation. 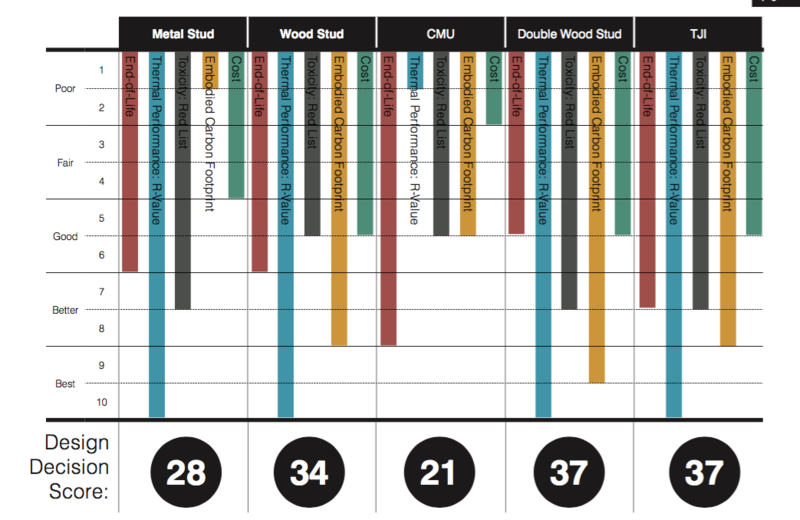 The double wood stud and the TJI wall assemblies were the best performers across every metric analyzed. Cellulose and fiberglass have a low embodied carbon footprint and low toxicity, but cellulose can be expensive, and both must be disposed in a landfill. Spray foam has a high insulating value per inch but performed poorly across all other metrics in the study. Extruded polystyrene (XPS) performed poorly when it came to embodied carbon footprint and toxicity, but it did well from a cost and end-of-life perspective because of its ability to be salvaged. Mineral wool was average in terms of carbon footprint, toxicity, and cost, and best under end of life. 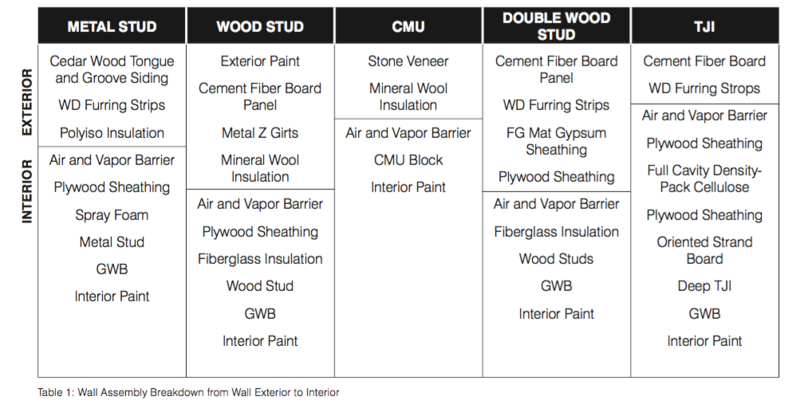 As a result, the researchers found that having XPS and mineral wool on the exterior, with fiberglass or cellulose in the cavity, scored the highest across all wall assemblies. Thanks Candace for bringing this study to our attention. Its conclusion that extruded polystyrene (XPS) "did well from an end-of-life perspective" is far from what our Healthy Building Network research team has found. The report's statement, for which the authors do not provide supporting citations, dovetails with plastics industry literature designed to create an impression that manufacturers are actively using post-consumer polystyrene, that the only barriers to the increased usage are public will and recycling infrastructure. In reality, efforts have been sporadic at best due to technical, economic, and ecological challenges. No current product literature for XPS insulation advertises the presence of any post-consumer material. Over all, post-consumer polystyrene recycling represents less than 1% of all the polystyrene resins sold in North America. Contamination during waste collection poses a major technical challenge for recycling polystyrene. Municipal waste facilities typically compact lightweight materials into manageable loads. This compaction impregnates the polystyrene with contaminants. A Canadian Plastics Association 2008 report, Densification of Post Consumer Expanded Polystyrene states, “Experience shows that polystyrene collected and processed through (recycling) facilities contains cross polymer and non-polymer contamination in levels of 5% -20%. These materials must undergo a secondary sorting process prior to recycling into new products." Beyond these economic and technical challenges lies the most serious challenge of all: polystyrene insulation is just not a very healthy building material. It is loaded with flame retardants and blowing agents. When polystyrene is shredded in mechanical recycling operations, blowing agents and other vapors are released into the workplace. In the case of polystyrene insulation collected from retrofit or demolition projects, these substances can include gases that were phased out of production decades ago, like CFCs, which were common blowing agents until 1995, when they were phased out of US production under the terms of the Montreal Protocol on Substances that Deplete the Ozone Layer. The lifespan of foamed construction materials, including polystyrene foam, is estimated to be 30-50 years. Like the CFCs of yore, halogenated flame retardants used in today’s insulation are tomorrow’s legacy contaminants. Flame retardants like HBCD are substances of global concern: they are among the most toxic, persistent, and bioaccumulative substances used in building products. Polystyrene insulation, as formulated now and in the past, is hardly suitable for a circular economy. We look forward to less toxic formulations in the works, which might bring these materials closer to usefulness after their service lives in buildings are done. We wondered about that as well, although it's not recyclability but rather the ability to be salvaged that led to the high score here. Definitely worth further discussion, however. We do not normally recommend XPS for anything due to the PBTs and high GWP, both of which, in our view, outweigh its excellent operational performance. Without air sealing all insulation performs poorly...this is known science. But were missing the entrance points where air invades our insulation cavity. We need to focus on framing to sheathing gaps at the bottom plate and top plates that go completely unsealed. Installing a AB on the wall face is not stopping air at its entrance points. It is midaigatuing but not s When properly sealed those thermal bypass gaps allow all of these materials to perform to their optimum levels. Hard to consider and I hesitate to use the word- Enclosure because countless data (ASTM E283) informs us that the wall cavity is a dynamic, fee flow of air currant. Conventional wisdom says the cavity has a convection loop occurring within the cavity. That would only occur if the cavity was actually sealed...correct ? Instead, ASTME283 (pressurizing walls assembly) demonstrates a free flow of air in a Stack-Effect from the lineal gap at the bottom plate come in contact with the framing member surface . The same condition is duplicated at the top plates allowing air in at the bottom and out at the top. Then add another factor to the mix. The superior flow from soffet- to- ridge is directly above the wall cavity that's quantified to leaks air from every connection point of sheathing to framing members. A Venturi Effect occurs pulling air up through the cavity assisted by the stack-effect. Can't get worst than that line up! If you accept this new concept look deeper. Perhaps the warmed conditioned air exiting the wall cavity through the insulation at the top is the contributing factor to ice damning? Everything lines up to gain a new perspective to the invisible invader, air entering and leaving the wall. A simple test to prove my point. From the inside wall pour a cup of water in a open stud bay where the sheathing meets the framing. The water will disappear...AIR is 800 time Less dense than water!